Before you can update uReport templates it is important that you first understand how uReport works. 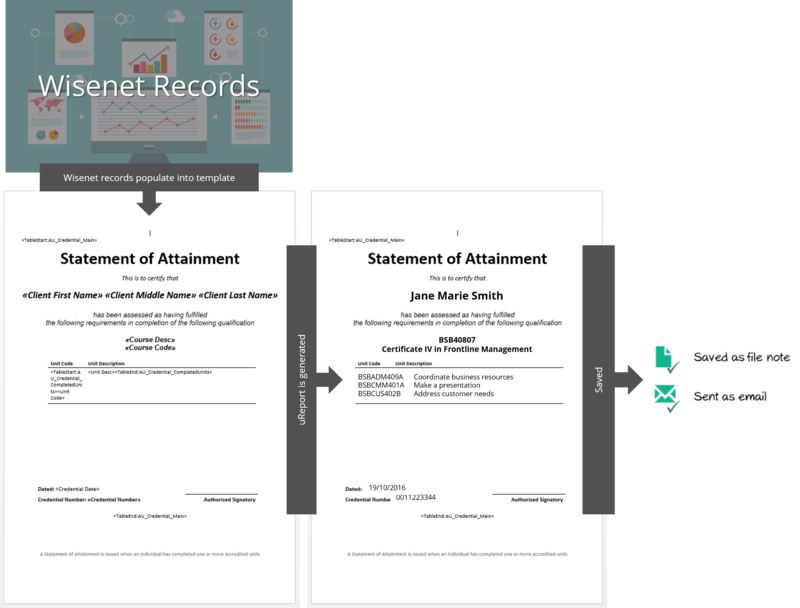 uReport uses a Microsoft Word document that contains required text and ‘mailmerge’ references to Wisenet fields that when processed will generate a correctly formatted PDF document (refer to illustration). 2 What is the difference between a Region and a Field? 4 What is a Main Region? 5 What does a Region look like? 6 How can I get a list of all available regions? 7 Why are there different Regions? 9 Can you add a field to a Region for me? 10 What is a Sub Region? 11 How can I get a list of all available Sub Regions? 12 Why are there different Sub-Regions? 16 Can you add a field to a Region for me? 17 What is a Field? 18 What does a Field look like? 20 Can I delete unwanted Fields from my template? 21 How can I find out which Fields can be used in a particular Region? What is the difference between a Region and a Field? A Region determines the functionality of the uReport template. A Field works as a placeholder for information collected in Wisenet. Therefore, in order for a Field to work on a uReport it needs to belong to a Region. Regions are compulsory on a template as they define the Start and End of the template. 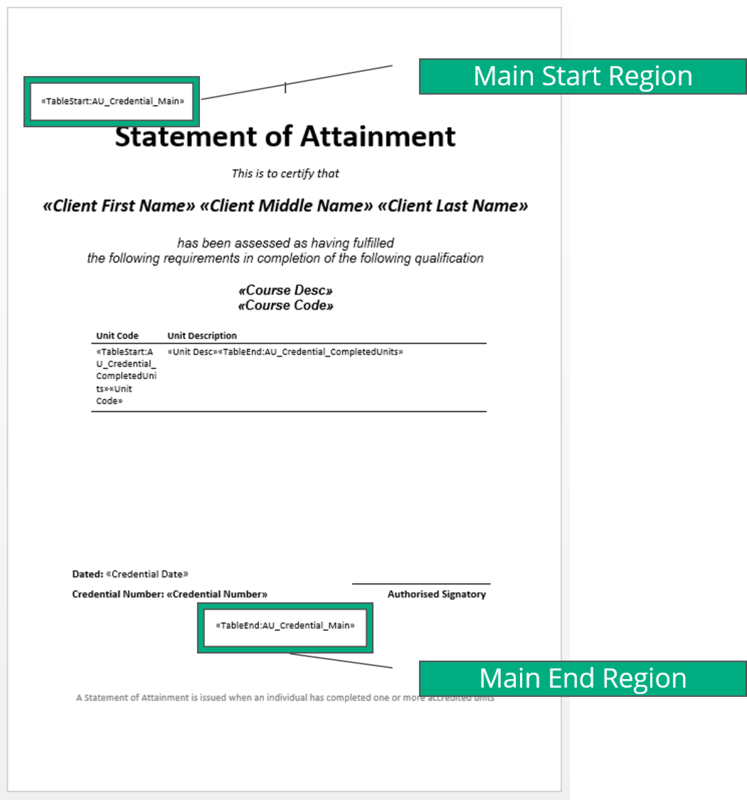 The Field is substituted with the individual details from the learner’s enrolment in the document when the document is generated. What is a Main Region? A Region determines the functionality of the template, therefore, each uReport template MUST include a matching Main Start and End Region tag. What does a Region look like? How can I get a list of all available regions? To the upper right hand side of this page you will find the uReport Field Dictionary. Click on the link and the dictionary will download on to your computer. Inside the dictionary is the list of Regions, listed in alphabetical order. Below each Region in the uReport Field Dictionary there is a short explanation of the purpose of the Region. This is followed by the list of Fields available for that particular Region. We keep this list inside LRM so it gets automatically updated whenever we add a new field or region. Why are there different Regions? There are different regions so you can have documents for different purposes. The information you need to show on a Letter of Offer can be quite different from the information on a Credential. To use a Region in a template you need the appropriate TableStart and TableEnd tags. There are three ways to do so. Download a pre-designed template from the uReport Templates section in Wisenet. 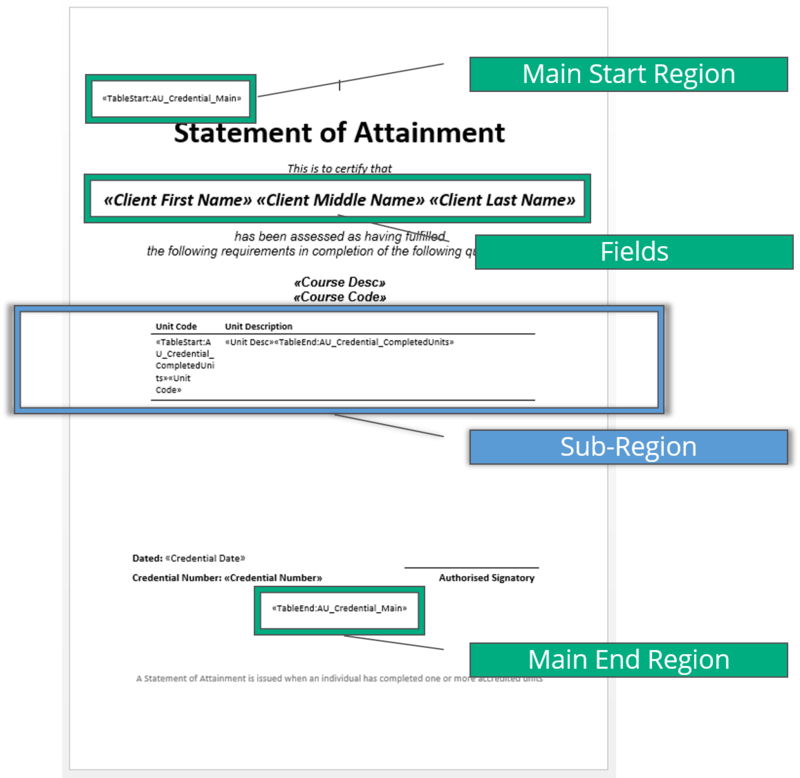 The template will contain the Main regions found at the beginning and the end of the document. Can you add a field to a Region for me? First do a quick check to see if the field is already available. If you still require the field please log a support request with your requirements. What is a Sub Region? Sub Regions in conjunction with Main Regions to display additional fields. For example, you may wish to include unit details in the Credential Type. This can be accomplished using the sub region tags. How can I get a list of all available Sub Regions? Why are there different Sub-Regions? There are different Sub Regions so to provide you with more options. Each Sub-Regions provides a list of Fields available to them as well as functionality. The uReport Field Dictionary provides a short description of each Sub-Region’s function capabilities, which is then followed by the list of available Fields for that particular Sub-Region. Imagine you’re setting up a template for a Transcript. This is a kind of credential – because you often want such a document recorded in the credentials register. The credentials main region allows the required Learner, Course Enrolment and Credential details to display. But now you have a choice. Do you wish to report all Unit Enrolments or only Competent Unit Enrolments? Some training providers prefer to show only competent units on their transcript; others show all enrolled units. The choice is yours. You just need to reference the right sub region based on your requirements. The Sub-region will then be updated and replaced with the Region name that was entered. Yes, deleting Fields and sub-Regions is fine, if you do not need them. Thus, the Field will convert and appear as what you have stored against your Learners First/Last Name in Wisenet. What does a Field look like? WARNING: If you add fields that do not belong to their parent Region, the actual field name will remain on the template instead of being replaced by data from the learner record. This will also happen when a field is inserted with the incorrect spelling. Example, field with wrong spelling: When a Field is manually added using step 2 above, misspelling the word first or last name can cause the Field to malfunction and not pick up any data. Be aware of this when manually adding fields. The following image shows an example where the “middle name” field is misspelled. Can I delete unwanted Fields from my template? Yes, if you don’t need them. Be sure to NOT delete either of the Main Start or End tags from your template. These are crucial in making your templates work. How can I find out which Fields can be used in a particular Region? You can see a full list of available fields by their parent Region in the uReport Field Dictionary.